ZABDIEL BOYLSTON, ONE of Boston’s most distinguished physicians, cowered in a hidden passageway inside his home. Outside, a rabble of angry townspeople demanded that he be lynched. They had gathered there after searching for the doctor throughout the city for several days and nights while flaunting a hangman’s noose as their flag. It was midsummer 1721 and Boston, a city of almost twelve thousand people, was suffering a devastating smallpox epidemic. Nearly half of the city’s inhabitants would contract the illness and one in fourteen would die. The mob had targeted Boylston for attempting the medical unknown. He had taken pus and scabs from the pocks of a patient with active smallpox and placed the putrid material beneath a small cut in the skin of healthy individuals, including several family slaves and his six-year-old son. Boylston intended to induce a mild form of smallpox in these patients, who would, he hoped, recover and be protected against the more severe attacks and possible death that resulted from contracting the illness naturally. “I resolv’d to carry it on for the saving of Lives,” he would later write, “not regarding any, or all the Menaces and Opposition that were made against it.”1 This rudimentary inoculation was untried and risky, even without the mob’s threats. The physician and his family feared for their lives with good reason. Boylston’s neighbors believed that he was a killer who would expand the disease’s toll. “To spread a mortal Contagion, What is it but to cast abroad Arrows and Death?” stated one outraged citizen. “If a man should willfully bring infection from a person sick of a deadly and contagious Disease, into a place of Health; is not the mischief as great?”2 Secreted for fourteen days, the doctor and his kin survived not only the mob’s intimidations but a dud hand grenade thrown into the house’s parlor. So terrified was Boylston that for several weeks after the mob attack subsided he visited his patients only at night and in wigged disguise. Boylston could do little to calm the raging fears but wait for the passage of time to prove his medical claims. The city’s selectmen scolded him, his fellow physicians labeled him unscrupulous, and vituperative journalists described him as a mass murderer. A weak-willed man might not have persevered, but the forty-one-year-old Boylston was no ordinary doctor, nor easily bullied. His earliest biographer said he possessed “a strong and reflecting mind, and acute discernment,” leading a life of “unimpeached integrity.”3 Unlike other practitioners who were less educated and poorly trained, the bold and stubborn Boylston never shied away from undertaking difficult medical cases. He had a reputation for performing virtuoso feats of surgery long before the inoculation crisis—in 1707, he had extracted an egg-sized stone from the urinary bladder of a thirteen-year-old boy, and a decade later, in the presence of clergy and other spectators, Boylston had removed a woman’s breast for the “repeated bleeding, growth & stench”4 of cancer. With no knowledge of virology or pharmacology (smallpox is caused by the double-stranded, DNA-rich variola virus), the colonials could only curb smallpox’s spread with strict isolation procedures. A Massachusetts statute even stipulated that all smallpox sufferers should be separated from the healthy population in designated “pox” houses. As the 1721 smallpox epidemic wore on, news of Boylston’s radical smallpox experiments panicked Bostonians, convinced that isolation was the only solution and that other approaches, especially inoculation, would worsen the plague. Then, the city’s renowned firebrand preacher, Cotton Mather, publicly declared his support of Boylston’s efforts, something few had anticipated. The fifty-eight-year-old, Harvard-educated Mather, the controversial pastor of the city’s original Congregationalist North Church, was a prominent public figure and Boston’s “keeper of the Puritan conscience.”6 Mather influenced both spiritual and secular matters, from his youthful persecution of witches to a middle-aged enthusiasm for medical and public health improvements. He advocated Bible societies, the education of slaves, religious missionary work, and temperance. He also helped organize a college in New Haven, Connecticut, and suggested that it be named after the major benefactor, Elihu Yale. In addition to all of this, Mather was, according to one historian, “the most original medical thinker in the colonial period.”7 He was, among other things, one of the first to realize the cyclical nature of smallpox epidemics. While Mather’s curiosity and intellect were rare, his interest in medicine was fairly common for a clergyman in the colonies. Minister-physicians, as they were known, continued a clerical tradition common to England and compounded by a paucity of decent healers in the new world. America’s preachers, the colonies’ best-educated and most well-read individuals, found that their book knowledge of medicine provided an effective way to establish rapport with congregants and the general public. Since religion and medicine had been interwoven for centuries, especially through the view that illness was the work of the devil and punishment for religious transgressions, it was de rigueur for colonial clergymen to attend to their flocks’ medical needs as part of pastoral care. During the early 1720s, Mather had read a series of articles in the Royal Society of London’s Philosophical Transactions detailing a little-known Asian and Middle Eastern folk medicine practice of inoculation for smallpox. It appeared from eyewitness accounts that when a person acquired smallpox through inoculation, the resulting illness was less deadly than a natural case. In fact, inoculation, the eighteenth-century version of modern vaccination (there was no word for immunization or immunity in that era’s scientific lexicon), caused a case of genuine smallpox, but one considerably milder than smallpox contracted at random. Those who received inoculation were as resistant to subsequent smallpox outbreaks as those who had acquired it naturally, despite the attenuated nature of the induced illness. The reaction of Boston’s approximately dozen physicians was contemptuous at best. Two of them united in violent opposition to the proposal, denouncing it as similar to introducing the plague in Europe. They declared that any attempt to put inoculation into effect would be “no less criminal than murder.”9 Dozens of pamphlets and broadsides were published in a back-and-forth war of words. The dispute became a cause célébre as the newspapers of the day teemed with accusations and character attacks. Mather made a personal plea to Boylston, the one physician who he believed would support his radical idea. “You are many ways endeared to me,” wrote the preacher, “but by nothing more than the very much good which a gracious God employs you and honors you to do to a miserable world.”10 Mather argued that, with an ongoing epidemic, inoculation should start as soon as possible. An unhesitant Boylston, whose face bore the undulating scars of a childhood case of smallpox, agreed. Two days later, inoculation, and threats to Boylston’s life, commenced. By mid-July, Boylston had successfully treated ten individuals and announced his results in the Boston Gazette (colonial newspapers functioned as modern medical journals and were filled with the latest clinical reports as well as advertisements for physicians’ services, textbooks, and drugs). He cautioned his critics that he was not afraid of their rage. “I have patiently born with abundance of Clamour and Ralary [raillery], for beginning a new Practice here (for the Good of the Publick), which comes well Recommended, from Gentlemen of Figure & Learning, and which well agrees to Reason,”11 insisted a determined Boylston. He was so intent that he inoculated an additional seventeen people in August, thirty-one in September, eighteen in October, and in November, at the height of the epidemic, one hundred and three. Shuttling between Boston, Cambridge, and Roxbury, performing up to a dozen inoculations a day, Boylston found that the better-educated townspeople sought his help while the uninformed masses, as well as most of the city’s physicians, feared it. Boylston pleaded with the other doctors to visit his patients and judge his results. Rather than accepting this offer, Boylston’s critics only intensified their scolding, accusing him of malpractice and murder. The incensed physicians spread their invective in the New England Courant, a newspaper published by James Franklin and his teenaged apprentice, his brother Benjamin. They argued that Boylston’s action was imprudent. It would widen the spread of smallpox and worsen the social upheavals brought about by the current epidemic. Commerce and daily business would be halted, and Boston would be an unlivable city under medical siege with no food or other necessities brought in. In November, popular resentment, simmering since the attempted lynching of Boylston in the summer, came to a head again when someone tried to assassinate Mather. The attacker threw a bomb through Mather’s window, but it failed to explode. The assailant had tied a chilling message around the device: “COTTON MATHER, You Dog, Dam you: I’ll inoculate you with this, with a Pox to you.”13 The attempted murder became the talk of the town and the courts offered a large monetary reward to find the perpetrator, but the case was never solved. By winter 1721–22, the smallpox scourge had ended and confirmed the assumptions of Boylston and Mather. Of the approximately 5,800 Bostonians who contracted the disease naturally, about 850 died, a death rate of almost 15 percent. The remainder of the city’s 6,200 citizens had been presumably exposed to smallpox in prior outbreaks and survived unscathed. Of the 247 people that Boylston inoculated, only six died, a death rate of less than 3 percent. Not only were deaths reduced, but the artificial smallpox attack was mild in character. “They found ease and sweetness, and lay praising God on their beds, or rather sat up in their chairs to do so,” said one contemporary observer about Boylston’s patients. “Their tongues were filled with laughter, and ours with thanksgiving on their account when we went to see ’em. We saw them recover fast.”14 To deliberately permit oneself to be infected with smallpox, however, was a terrifying decision plagued by the possibility of death or disfigurement. And in the eighteenth century, there was no obvious reason (nor has one been found in the twenty-first century) as to why smallpox acquired through inoculation should somehow be different from the disease that was contracted by chance. Yet the inexplicable worked! Unique circumstances and a fair bit of luck—if such a thing can be found during a smallpox epidemic—facilitated Boylston’s success. There is little doubt that inoculation, contrasted with present-day vaccinations, could have further spread an epidemic. His critics were correct when they demanded that inoculated patients, despite having only the mild form of smallpox, be isolated. Boylston’s good fortune was that the epidemic of 1721 was so severe and spread so quickly that the overwhelming number of individuals who naturally contracted the disease left few for the inoculated to cross-infect. Boylston again aroused public apprehension when, in the absence of an ongoing epidemic, he resumed his experiments in spring 1722. Once more, Boston authorities demanded that the newly inoculated be secluded from other citizens or Boylston’s experiments would be stopped. With his business completed, Boylston departed London a wealthy man, supposedly remunerated one thousand gold guineas by the king. Boylston’s biographer was careful to note that “he returned home with ample funds to enable him to retire from professional business.”17 Accorded acclaim upon his arrival back in Boston, Boylston was given the epithet “The Great Inoculator.” He enjoyed the role of a well-to-do colonial physician and gentleman farmer for the remaining forty years of his life, celebrated by English followers and grudgingly admired by American adversaries. Although it took time for Boylston to earn his peers’ admiration, his career and accomplishments were defined by a willingness to challenge conventional wisdom, a go-it-alone mind-set that appears repeatedly in moments of discovery and innovation throughout the history of American medicine. Despite lower death rates for the inoculated versus the naturally infected, the practice of inoculation remained restricted and unpopular in the colonies. It would take several decades to spread from New England to New York, Philadelphia, Baltimore, and Charleston. The idea of inoculation was vigorously debated during these years, with one unexpected advocate taking a central role in the discussions, the up-and-coming Benjamin Franklin. Franklin was involved in the inoculation fracas at a relatively early age and became a staunch advocate of the practice. In the spring of 1730, while still in his midtwenties, he informed readers of his Pennsylvania Gazette about the virtues of the procedure (this was in direct contrast to his older brother, who continued as an anti-inoculationist) and how it could mitigate the consequences of a smallpox epidemic. In 1736, when Franklin’s son died from naturally acquired smallpox (the infant had not been inoculated due to his age), Franklin immediately published a public letter in the Gazette to dispel rumors that the child succumbed to an inoculation gone awry. A decade later, Franklin made certain that his daughter was preventively inoculated as early in her life as possible. When Franklin was sent to London in 1757 as an official representative of the Pennsylvania Assembly, he campaigned vigorously for inoculations in Europe, particularly for the poor, and even wrote the preface for a physician friend’s widely distributed pro-inoculation pamphlet. He then dispatched fifteen hundred copies of the leaflet to American doctors and leading public officials. But there were other, personal reasons for Franklin’s commitment. As a young man, he had met Boylston while living in London and working as a compositor in a printer’s shop. Franklin had been, in his words, “reduced to the greatest distress, a youth without money, friends, or counsel.” He turned to Boylston, the most lauded of American celebrities in the city, who acted as a surrogate parent. Boylston provided monetary support and fatherly advice. “I was saved from the abyss of destruction,”18 Franklin told a grandnephew. Later on, Franklin, who admired and believed in Boylston’s use of medical statistics, sent the numbers to friends and family members, expecting them to spread the word. He rarely revealed to these individuals the personal gratitude he owed Boylston. Franklin’s unparalleled renown bolstered support for inoculation in a way that no doctor, even one as famous as Boylston, could. His enthusiasm had wide-ranging consequences, from the construction in 1762 in Philadelphia of a specialized inoculation hospital to the increased willingness of wealthy individuals, especially politicians, to undergo the treatment. Franklin’s influence in this arena among the intellectual elite and politically powerful altered the course of history in America more than once. George Washington, the most prominent founding father and general of the Continental Army, heeded Franklin’s counsel on inoculation and by doing so changed the outcome of the Revolutionary War. Washington’s pockmarked face betrayed a teenage familiarity with smallpox. He understood that the most important deterrent to vulnerability to the disease was prior exposure. In March 1776, rumors abounded that British troops in Boston were attempting to spread smallpox by placing blankets previously used by infected soldiers in various neighborhoods. Fearing the disease would decimate his mostly unexposed troops—upward of one hundred soldiers per week were already dying of smallpox—Washington decided not to mount an attack against the Redcoats. The next winter, Washington, in the face of public skepticism and a stalled war effort, yielded to the wishes of Franklin and others and had mass inoculations performed on veteran troops in Morristown and Philadelphia and new recruits from New England, the middle Atlantic colonies, and Virginia. Inoculation was carried out at Valley Forge a year later. As the grand experiment progressed, it became obvious that Washington was correct in opting for prevention over serendipity. The decision to have the Continental Army inoculated against smallpox was one of the greatest strategic and medical decisions ever conceived by a wartime general. It changed the outcome of the conflict and secured the beginnings of a new country by improving the health of the soldiers. Less dramatic but equally important was Franklin’s insistence that delegates to the Continental Congress get inoculated. When the First Continental Congress met in Philadelphia in fall 1774, the arriving politicians convinced local physicians to halt inoculations because several of the delegates had never been exposed to smallpox. They argued that this pause in inoculations reduced the risk of infection of vulnerable delegates, but Franklin understood the folly of the decision. When the Second Continental Congress began its deliberations in May 1775, Franklin strongly advised susceptible individuals to submit to prophylactic inoculation in view of the pox-plagued environment. Several members, including Josiah Bartlett of New Hampshire and Virginia’s Patrick Henry, acted on his recommendation. How many other at-risk delegates paid attention to Franklin’s counsel is unknown. At least one individual, Samuel Ward of Rhode Island (his great-granddaughter was Julia Ward Howe, composer of the “Battle Hymn of the Republic”), ignored Franklin’s admonitions and succumbed to smallpox when the assembly was in session. Few doctors had any level of formal medical education and training. They attended no lectures, performed no laboratory experiments, and never dissected a cadaver. They titled themselves “doctor” not because they had received a diploma, but for the simple reason that they were doing what men with university medical degrees usually did: they took care of patients. Medicine was more of a trade, a means to secure the scraps of a livelihood. Most colonial physicians were poorly paid and supplemented their income by farming, managing a small business, or owning an apothecary shop, like Boylston, who did all three. There were no licensing authorities, no qualifying examinations, no medical schools, no professional societies, no hospitals, and no medical literature. Health care workers plied their trade without regulations and there was little societal interest in the acquisition or dissemination of medical knowledge. The apprenticeship system was the principal method of medical education and training available in the colonies (Boylston, for example, served as an apprentice to both his physician father and other eminent Boston-based physicians). It emphasized clinical common sense and practical medical, along with surgical, experience, but since individual preceptors established their own standards of schooling, the quality and quantity of apprenticeship instruction varied greatly, and even in the best circumstances the information conveyed was more superstition than science. It was not uncommon for a doctor to treat his apprentice like an indentured servant rather than as a trainee in the art of healing. The teenager was just as likely to look after the physician’s horse and saddlebags or serve the evening’s meal as he was to prepare medicines, bleed and blister patients, and read the doctor’s medical books. The end product of the apprentice system, the generalist doctor—distinctions between physicians and surgeons did not exist—would dominate the American medical scene until specialists arose in the final years of the nineteenth century. In the mid-eighteenth century medical education first began to expand beyond the apprenticeship system with the advent of private anatomy courses, an early step in the process of professionalization. Although these endeavors were nothing more than nondescript lectures and anatomical demonstrations to groups of eager students, they represented the earliest attempts to provide some manner of formal medical education. Doctors-to-be paid a fee, and they received a signed document at the course’s conclusion attesting to their faithful attendance. Instructors soon supplemented these anatomical courses with lecture series in chemistry, which, in turn, led to the organization of the earliest medical schools. It was also during these years that sons of wealthy colonial families first began to pursue medical education abroad, particularly in the schools of Edinburgh and London. Once resettled in their colonial home cities, they were regarded as physicians in the European sense—that is, as practitioners of privilege with a snobbish university degree. Though poorly trained doctors and various quacks continued to flourish in North America, their presence was increasingly challenged by a vocal cadre of these American-born but British-educated young men. As the better-educated doctors thrived and grew politically stronger, medicine came to rely on their English medical traditions, especially when it concerned a physician’s education, training, and practice routines. Medical organizations, another important symbol of the colonial doctor’s emerging professional awareness, first came into existence around this time as well. In 1755, for example, physicians in Charleston, South Carolina, announced in the city’s newspaper that they were banding together to protect their financial interests. “We are often called out under the greatest inclemencies of the weather, sometimes merely to gratify the Patient,” they complained, “and are often slowly and seldom sufficiently paid.”22 To settle the issue, the physicians announced that they would go on strike unless a reasonable fee was paid at every consultation. Medical care and medical education in the late colonial period grew and developed alongside broader cultural and economic progress. The population had enlarged noticeably due to a self-sustaining increase in the number of original settlers and their families plus a surge in immigration—estimates for the year 1760 place 1,695,000 individuals in the colonies (approximately 310,000 were African Americans). Outside the urban areas, however, communication remained slow. One stagecoach every few days was the sole connection between the few cities; otherwise contact depended on private conveyance, usually canoe, flatboat, or horseback. Colonial towns grew in size as a newfound prosperity transformed the continent. A moneyed class emerged with well-fed and well-housed families demanding more of the social and educational amenities of life. Artisan and mechanic classes arose with demands for political power, separate from the claims of the wealthy. By the mid-eighteenth century eight of the colonies had their own private colleges and a public library movement was under way. Weekly newspapers and monthly magazines were available in most major cities. Music was cultivated and larger towns supported their own orchestras. Morgan returned to Philadelphia in the spring of 1765. In terms of learning and experience he was now the best medical man in the colonies, and hoped to use his knowledge to transform the country’s system of medical education and clinical traditions. Morgan felt that both the apprenticeship system and the supplemental lecture series in anatomy and chemistry had definite sociocultural limitations despite their success in producing clinical practitioners. They failed to provide professional status, which in Europe belonged only to men with university medical degrees. A diploma from a university-affiliated school of medicine was more than just a credential of know-how; it was a warrant of academic authority, something the apprenticeship system’s certificate of proficiency did not provide. A university education also inculcated the demeanor and manners expected of a physician if he was to receive the respect due him as a professional person. Morgan had set forth his proposal for an American academic medical school in a short manuscript that he intended to publish once back in Philadelphia, and his plans were strengthened with a letter of support from Thomas Penn, the sole proprietor of the Pennsylvania colony by royal fiat. Morgan asked Penn to persuade the trustees of the College of Philadelphia to appoint professors for the study of medicine and surgery, thus establishing the colonies’ first school of medicine. “Gentlemen,” wrote Penn, “his [Morgan’s] scheme will give reputation and strength to the institution, and though it may for some time occasion a small expense, yet after a little while it will gradually support itself, and even make considerable additions to the Academy funds.”30 The trustees received the missive in early May 1765, and less than four weeks later, Morgan was standing on the rostrum, dressed in professorial robes (the trustees chose him to be professor of the theory and practice of medicine), as he delivered the public commencement address for the College of Philadelphia. To the surprise of his audience, Morgan insisted that Philadelphia’s new medical school should only accept students who first pursued premedical studies as part of an undergraduate degree. Complaining that anyone could proclaim himself a doctor after hanging around a physician’s office, Morgan demanded that, in addition to an apprenticeship, admitted students be proficient in Greek, Latin, French, mathematics, and natural philosophy. “Destitute of that general knowledge,” he contended, “we cannot penetrate into those truths, that form the rules by which we ought to conduct ourselves, in the cure of diseases.”35 Once matriculated, the doctor-to-be was to study anatomy, botany, chemistry, clinical medicine, materia medica (drugs and other remedial substances), physiology, and pathology. While Morgan drew many ideas on medical education from European models, he broke from the Continental archetype, especially as concerned hospitals. Morgan based the concepts in his Discourse on a style of medical education where the school was affiliated with a university; the more common European and English approach organized medical schools alongside hospital wards as an extension of academic bedside teaching. Morgan could have allied his Philadelphia school with the Pennsylvania Hospital, a thriving health care facility and America’s first permanent hospital for the care of needy sick, but he decided against it. This was surprising since Franklin, one of Morgan’s main counselors, cofounded the hospital. Many colonialists in Morgan’s day probably knew about hospitals, but only a small minority had intimate knowledge of one. America’s hospitals were few in number, poorly managed, and unable to provide administrative support to an affiliated medical school. Aside from almshouses, inoculation buildings, and pest houses, only two general institutions, the Pennsylvania Hospital and the Charity Hospital in New Orleans, were functioning at the end of the Revolution. They were facilities of last resort, ignominious places to receive medical care. These institutions were no more than shelters for those who could not afford treatment at home, had no family to provide nursing needs, or lived in such adverse conditions that there was no space in their house for the sick or dying. Morgan’s scheme of a university-affiliated medical school, augmented with hospital-based instruction, quickly became an accepted blueprint for the future development of American medical education. “It had been shown how,” according to Henry Sigerist, one of the renowned medical historians of the mid-twentieth century, “without great ostentation or expense, and using existing equipment, it was possible to give medical instruction an academic form.”38 Medical teaching in this country developed over the next century and a quarter tied to educational institutions, whereas most European countries, including England, organized medical education around hospitals. Morgan had developed a sophisticated model for schooling the colonies’ doctors, an important step in the march toward medicine’s becoming a profession. “The historian who shall hereafter relate the progress of medical science in America,” cautioned Morgan’s earliest biographer, “will be deficient in candor and justice, if he does not connect the name of Dr. Morgan with that auspicious era, in which medicine was first taught and studied as a science in this country.”39 Two years after the school opened, the first students graduated, and by 1774 thirty-four medical degrees had been conferred. Morgan’s accomplishment prompted physicians in New York City to establish a medical school in affiliation with King’s College (later Columbia University), patterned after the Philadelphia institution. Both of these schools soon discontinued the M.B. and only awarded the M.D., a degree which, thereafter, became customary for American medical students. At the least, the Philadelphia and New York City schools offered a reasonable alternative to traveling to Europe for a medical education. Morgan also demanded that doctors’ fees be increased. “Were they [physicians] born slaves to the public,” asked Morgan, “or, for such a voluntary surrender of their liberty and ease as is necessary to practice conscientiously, are they to have no compensation?”41 Higher standards in education should lead to higher fees for advice. Morgan may have been explicitly asking for the guarantee of higher income, but he was implicitly also pressing for doctors to assume control of the practice of medicine. The increase of socioeconomic worth and the development of a nascent professional identity go hand in hand. Morgan wanted to take physicians, who were often divided over clinical questions and financially insecure, and create a united and prosperous profession. Relying on Philadelphia’s role as the colonies’ social and economic magnet, Morgan hoped to found an august “College of Physicians,” based on the British brand, which would administer examinations and license doctors on an intercolonial basis. “Societies form a kind of magazine [warehouse], which collects together all the knowledge of the learned, and consecrates it to public utility,” according to Morgan.42 His mantra was that his society would assist physicians to govern themselves, thus promoting professional unity and socioeconomic strength. Morgan understood that for professionalization to occur, cultural authority needed to be established and a series of complex economic, political, and sociological transformations required within American medicine and society. For professionals to enjoy special power and prestige, substantial numbers of individuals had to be united in seeking technical competence, standardized education and training, job autonomy, monopoly over practice, and a philosophy of public service. Social and economic stature would follow once these conditions were fulfilled. Such changes did not come easily. The passage from a preindustrial, largely rural, and tradition-based society to one in which American physicians regarded themselves as a distinct class of upwardly mobile professionals would not be completed until the turn of the twentieth century. But Morgan’s preparatory steps signaled the beginnings of the struggle for professional identity and medical distinctiveness. Unlike his medical school initiative, Morgan’s scheme for a centralized medical licensing authority shortly met with opposition. The College of Philadelphia’s administrators feared that if a certifying body were created, even a dignified College of Physicians, it would interfere with the functions of their new medical institute. Penn, the colony’s proprietor and a Morgan devotee, agreed and refused entreaties to grant a charter. “I think it very early for such an establishment”43 were his final words on the subject. Morgan failed in this aspect of his plan to professionalize American medicine, but nascent licensing efforts had already begun in other colonies. In 1760, New York City officials enacted a law stipulating that no one should practice medicine or surgery unless he had taken an examination for licensure. Nine years later Samuel Bard, a well-known physician in the city, reemphasized the need for licensure when he spoke on the expected professional conduct of a physician at the first commencement ceremonies of the King’s College medical department. Bard’s Discourse Upon the Duties of a Physician, published several days later, became the earliest American writing on medical ethics. Across the Hudson River a group of physicians in 1766 formed a New Jersey medical society, the only state or county medical association that would survive the American Revolution. These physicians requested that the provincial government establish a licensing system and set fines for those who disobeyed the law. And, in a nod to patients’ rights, it was mandated that bills be written “in plain English Words.”44 The membership, concerned with raising practice standards as well as income levels, also insisted on publishing a uniform fee table (a simple visit by a doctor cost ten shillings, a nighttime consult necessitated an additional five shillings, removal of a cataract ran three pounds). The public stood in the way not only of Morgan’s and others’ advocacy of licensing, but also their pleas for the most basic of all health studies, human dissection. Understanding the workings of the human body was central to medicine’s future growth, particularly the evolving discipline of pathologic anatomy, which was already well accepted in Europe. But such investigatory work hardly existed in colonial America. Public hostility toward anatomic studies exploded during the 1788 “Doctors’ Mob” riot in New York City, when a group of vigilantes tried to lynch doctors teaching human dissection. The rioters refused to disperse despite the pleas of several luminaries, including Alexander Hamilton, John Jay, and Baron von Steuben, the Prussian army officer who served as inspector general of the Continental Army during the Revolutionary War. Militiamen were summoned and the confrontation ended with shots fired and eight demonstrators dead. For three days, in a frenzy of retribution, bands of vigilantes terrorized the medical profession, threatening, according to one account, “a general Hegira of physicians.”46 Medical students were secretly stowed in carriages and evacuated to the countryside as doctors hid wherever possible. Following two days of oratory, Morgan made a stunning closing announcement to the assembled Philadelphia throng. Not only had he recommended the separation of surgery and pharmacy from medicine, but he was going to practice what he preached. He told the startled crowd (among those present was the colony’s governor) that he had imported a fully trained surgeon/apothecary from England, the first ever seen in America. Henceforth, Morgan would refuse all surgical cases and the dispensing of medicines. He insisted that any of his future patients in need of surgical care or pharmaceuticals would have to avail themselves of his colleague. “What I expect from them [patients] is a proper compensation for my advice and attendance as a physician,” contended Morgan.47 He claimed that when a patient received a bill for treatment, the individual did not know what portion of the cost was for drugs versus medical expertise. This demeaned a physician’s services and was unworthy of someone who deserved to be compensated as a university-educated scholar, not as a mere maker of pills and potions. And as an expensively schooled physician, Morgan expected to be paid more than other practitioners of his day. Unfortunately for Morgan, when he stepped off the rostrum his medical career had just reached its zenith. Morgan would sit in his office at Second and Spruce Streets waiting in vain for patients to appear. He was probably the only physician in Philadelphia, if not all thirteen colonies, who refused surgical cases and did not dispense drugs. With the sick slow to appear at his doorway, Morgan was eventually forced to become what he most detested, a colonial physician who had no economic choice but to push pills. What happened to his partner, the English surgeon/apothecary, remains a historical question mark. Morgan’s enduring political contacts soon led him in other directions. With the onset of the Revolution, Congress appointed him director general of hospitals and physician in chief for the Revolutionary army. The Continental Army early on was an amateurish outfit, and the medical organization was even more slapdash. The ever-effete Morgan was intolerant of the situation and went about curtly changing things. From asking physicians to take a competency examination to scolding soldiers he believed to be malingering, Morgan worried little about tact or the enemies he might be making. Stories soon spread of Morgan’s inhumanity and how he ruled by absolute fiat. Physicians told of worsening conditions in military hospitals, so horrendous that to send sick soldiers to them was tantamount to murder. These were the same apprentice-trained, mostly country practitioners who, just a few years ago, Morgan publicly criticized as representing the underbelly of American medicine. The political infighting against Morgan grew and brought about his downfall just fourteen months into his appointment. Back in Philadelphia, a resentful Morgan fussed and fumed and wrote a scurrilous pamphlet in his own defense. He was later vindicated, but few cared. Morgan’s final years were spent largely in solitude. In 1787 he became peripherally involved in establishing the College of Physicians of Philadelphia, but despite his prior recommendation, the institution’s charter did not include a provision for licensing as he had hoped. His earlier optimism that such an organization would spur America’s doctors to perform sophisticated scientific investigations, thus leading to justifiable claims of professional superiority and widening the sociocultural gap between them and quacks, soon faded. The College of Physicians did contain one of the country’s first medical libraries, but the building was more of a social gathering place for Philadelphia’s physician elite than a scientific research institute. Morgan’s last days were spent in a small hovel, on a filthy bed, forgotten by most Philadelphians. His funeral was attended by several leftover friends. There were few tributes and no tombstone ever marked Morgan’s final resting place. American medicine had passed Morgan by in the end, but many of its developments had resulted directly from his zeal. A cadre of elite physicians had arrived and would provide the basis for future professional growth. More important, the new, albeit few, quasi-university-affiliated medical schools would serve as the foundation for many of these changes. Clearly, Morgan was farsighted, especially in the realm of medical education—a more comprehensive scheme for its reform would only be offered in the 1890s with the opening of The Johns Hopkins Hospital and its affiliated School of Medicine in Baltimore. Unfortunately, he was also a vainglorious and stubborn man who was at his worst when it came to managing sensitive issues. In hindsight, Morgan’s efforts to professionalize medicine were premature and ill served by his abrasive demeanor and absolutism. Despite his endeavors, colonial doctors continued to practice a combination of medicine, surgery, pharmacy, and midwifery without undergoing a licensing examination. Physicians needed one voice to advance their status and improve medical care, but for self-educated and self-determined men, left on their farms and in small-town habitats, this remained impossible to achieve even though Morgan had already articulated many of the vital ideas. The main eulogy during Morgan’s memorial service at the College of Philadelphia was delivered by Benjamin Rush, a rising star on the city’s medical scene and a Morgan protégé. He movingly told of his mentor’s “uncommon capacity for acquiring knowledge” and how Morgan “advanced in every part of Europe the honour of the American name.”48 Rush had learned much from Morgan, but the most important trait he acquired was the ability to stand out from among his peers. Highly regarded for the intensity of his clinical convictions as well as a domineering style of interpersonal relationships, Rush (and his Morganesque personality) would shortly fashion the earliest well-recognized American style of medical practice. Ira Rutkow is a general surgeon and historian of American medicine. He also holds a doctorate of public health from Johns Hopkins University. 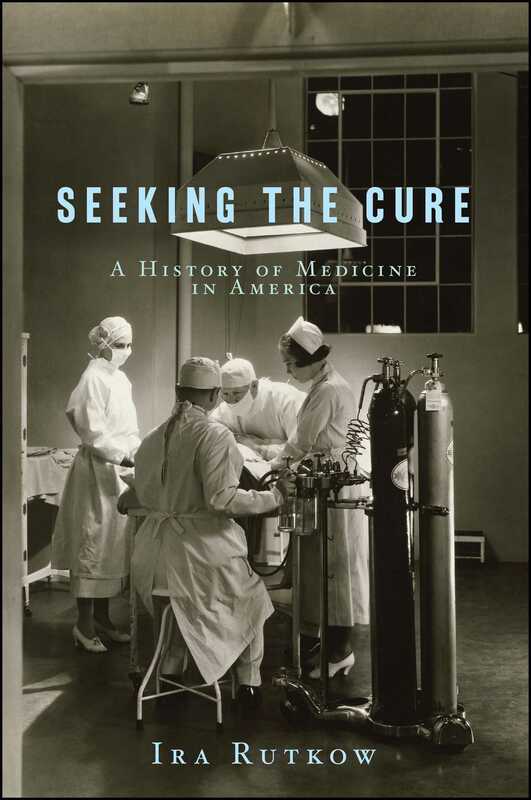 Among Dr. Rutkow’s books on medical history, his Surgery: An Illustrated History was selected as a New York Times Notable Book of the Year. Dr. Rutkow’s recent works include Bleeding Blue and Gray, a narrative history of Civil War medicine, and James A. Garfield, a political biography and reappraisal of the medical aspects of Garfield’s assassination. Dr. Rutkow and his wife divide their time between New York City and their farm in the Hudson Valley.